IB Economics (and, not only): Paul Krugman rules! This year's winner of the Nobel prize in Economics is Princeton economist and NYT columnist Paul Krugman. Unfortunately guys, I never did bet and I thus didn't win any money, but I was right in predicting that he would win the Nobel prize this year! Check out my October 7 post 'This one is for you, Alex'! 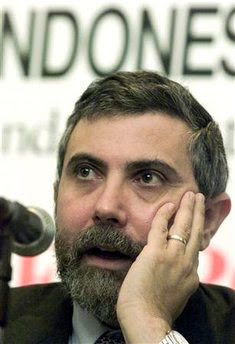 The prize committee lauded Mr. Krugman for “having shown the effects of economies of scale on trade patterns and on the location of economic activity.” Mr. Krugman is probably more widely known as a perpetual thorn in George Bush’s side from his perch as an Op-Ed page columnist for nearly a decade. His columns have won him both strong supporters and ardent critics. The Nobel, however, was awarded for academic — and less political — research that he conducted primarily before he began regularly writing for The Times. He has developed models that explain observed patterns of trade between countries, as well as what goods are produced where and why. Traditional trade theory assumes that countries are different and will exchange only the different kinds of goods that they are comparatively better at producing; this model, however, was not reflected in flow of goods and services Mr. Krugman saw in the world around him. He set out to explain why worldwide trade was dominated by a few countries that were similar to each other, and why a country might import the same kinds of goods that it exported. In his model, companies get more efficient at producing their goods as they sell more. Consumers like variety, so they pick and choose goods from among these producers in different countries. He developed this work further to explain what effect transport costs, which obstruct trade, should have on migration patterns. He helped explain under what conditions trade would lead to concentration or decentralization of populations. Mr. Krugman’s models have been praised for their simplicity and practicality — features economists are often criticized for ignoring. Mr. Krugman has been writing his Op-Ed page columns for The Times since 1999. In recent years, in his column and a related blog on nytimes.com, he has frequently and unrelentingly criticized Bush administration policies. It's great that right now we are discussing trade theory in class. I hope that at least my ambitious group will take some time to check out a few things on the net about his ideas and contributions to orthodox economic theory. Even if you just bookmark the stuff for later! I feel now even better adopting these past few years his introductory textbook for my IB economics classes! Here is the Unofficial Paul Krugman site. Here you can find summaries of his NYT articles. And this is on his latest book "The Conscience of a Liberal".